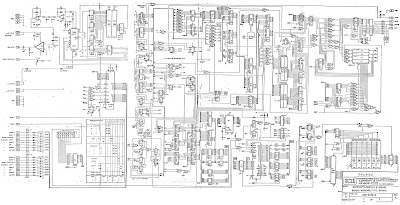 Not In Mame: Bagman pcb repair notes. I've labeled this one as notes rather than a repair log as it was three different boards I repaired at once and not everything is covered. A lot of TTL needed to be replaced to get these up and running. Some issues I noticed across all three boards were that the Z80 cpus were bad and when removing them from their socket some of the pins broke off and stayed in the socket. Bad PROMS in general, on one of the boards all three were bad. This causes colour issues and no speech. An issue across all three boards was bad / missing video sync. This was a combination of bad 74LS161s @ A4, A5, B4 and B5. Bad 74LS283s @D2 and D3 again on all three boards. The four sprite rams (27LS00) were fine on all three boards. One final note, the PAL @ P6 is used for 'guards controlling' according to mame, which I guess is a cryptic way of saying controls the enemies. With the PAL removed the enemies seem to behave the same but I am guessing later in the game they behave differently and that it might make the game harder with it removed. A similar security measure to what Bubble Bobble used maybe? 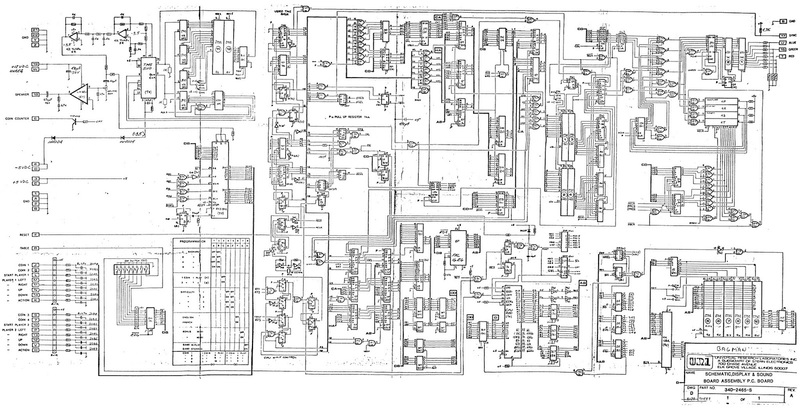 To help with my repairs I took the existing pdf scans of the schematics which are split up over several pages and combined them into a single page using photoshop. There's still quite a few areas that aren't legible unfortunately but I don't think the originals were that good to begin with.